Research shows that more than 50% of recruitment costs are indirect and that average cost of hiring a new employee in the UK is around £5,300. What’s more, the average interview takes 30 minutes with the recruiter doing 70% of the talking and the average time spent looking at a CV is 5-7 seconds. 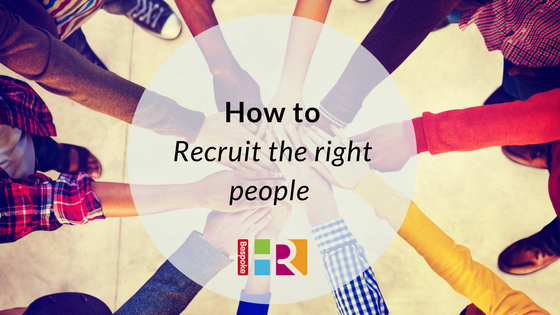 For many small businesses, effective recruitment is a minefield. Create an accurate job description, what do you want this person to do? What background or skills do the need? What is the level of responsibility? Be clear on what you need; a vague advert calling for an ‘all-rounder’ is likely to give you a flurry of applications, but take up considerable time to process. Decide on salary and include it. This will help you find the right level of candidate, save you time on irrelevant applications and help with being found on online job searches. According to Reed, two in three job seekers are more likely to apply for a role if they can see the salary. Make sure you are paying above the National Minimum Wage – £8.21 per hour (as of April 2019). Consider if you will be paying bonus, commission or any other benefits. Think about what you pay other employees and make sure it’s ‘in-line’. Don’t forget, a job advert is your chance to showcase your business. You need to remember you are selling the role to the candidate, and not the other way around. Be careful not to use any discriminatory language in your advert – have a look at our checker to make sure you don’t fall into that trap. General websites, e.g. Monster, Reed, Total jobs etc. Industry specific – e.g. The Caterer for hospitality roles. Newspapers – although these can be expensive. Do you have a suitable room / layout? Do they need to be introduced to the team? Will you be using other testing techniques e.g. presentation, psychometrics etc? What questions do they have and what benefits/rewards can the company offer? Applicants should be assessed on suitability for the role based on skills only and application process should always be documented. Rejected Applicants can request feedback within three months of their applications and reasonable justification should be provided for their failure to be appointed. Note that applicants should never be rejected for any of the protected characteristics. Consider different interview techniques, such as competency-based questions. Also known as situational Interviewing – it is a style of interview that asks the candidates to provide evidence of where they have displayed a skill in the past that demonstrates their capabilities. Tell me about a time…. Give me an example of when you have…. Can you recall a situation when…? Candidates are prospective employees, but they may also be potential customers their friends or relatives may also be too! Whether they are offered a job or not, the way in which you treat candidates can play an important role in maintaining a favourable and professional company image. Remember that an interview is a two-way process and the candidate will be selecting you as much as you are selecting them. The golden rule of selection is therefore – TREAT THE CANDIDATE AS A CUSTOMER. Consider whether you need a second-stage interview to choose the right candidate. To ensure you select the right candidate and have a robust audit trail, you should use a score sheet. If there is more than one interviewer – these should be completed by each person without conferring. The score sheet will help you with the rationale as to why the candidate has been unsuccessful. Remember that any documentation from the interview can be requested by the employee. We can help with all aspects of the recruitment process.